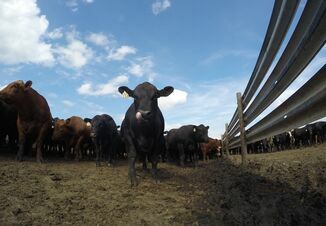 When foot and mouth disease (FMD) broke out in the United Kingdom in 2001, authorities focused on a traditional “stamping out” approach, culling about 10 million animals at a direct cost of about 9 billion. In contrast, Uruguay experienced a similar outbreak that same year, but turned to vaccination as a primary control strategy. The country culled fewer than 7,000 animals and kept direct costs for the outbreak to around $240 million. That historical perspective, coupled with analysis accounting for the massive scale and economic value of the U.S. livestock sector, has influenced infectious-disease experts and the USDA to shift their thinking and re-order their priorities in FMD response planning. Strategic depopulation remains a key component in plans for mitigating a FMD outbreak, along with recognition that with planning and quick response including vaccinations and biosecurity, the cattle industry could protect business continuity while minimizing costly culling. At Iowa State University’s Center for Food Security & Public Health, director and distinguished professor Jim Roth, DVM, PhD, ACVM, and his team, have worked at the forefront in developing FMD prevention and response plans for multiple livestock species. His team includes Danelle Bickett-Weddle DVM, MPH, PhD, DACVPM, Reneé Dewell, DVM, MS, and Molly Lee, DVM. 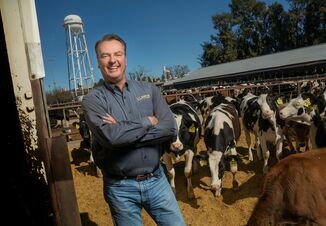 In cooperation with Federal and State animal health officials, industry veterinarians and veterinarians at Iowa State University, Kansas State University, University of Minnesota, and University of California-Davis, the team has developed the Secure Milk Supply (SMS) and Secure Beef Supply (SBS) Plans, which focus on maintaining business continuity while aggressively mitigating an FMD outbreak. The group also developed a Secure Egg Supply Plan for the poultry industry, as well as a Secure Pork Supply Plan. These Secure Food Supply plans were funded by USDA APHIS Veterinary Services and are components of the USDA’s overall Foreign Animal Disease Preparedness and Response Plan (FAD PReP). The ISU team notes the new approach better reflects the needs of the U.S. livestock industry, based on its size, structure and extensive movement of animals in commerce. Recognizing that all cattle, even uninfected animals in a regulatory Control Area, might be subject to movement controls, including movement of live animals to slaughter or to other production phases. Other control strategies in the new approach include vaccination and managing cattle through the disease to recovery and strategic depopulation. The Secure Food Supply’s continuity of business provisions allow for the ability to move milk to processing and cattle to harvest from operations with cattle that have no evidence of FMD infection. The scientists developing the beef and dairy plans say the poultry industry’s response to the highly pathogenic avian influenza (HPAI) outbreaks during 2014 and 2015 provided valuable experience for maintaining business continuity. Lee notes that a paper published by the Agriculture and Applied Economics Association following these HPAI outbreaks documented the value of permitted movement to business continuity. “Most importantly for producers, permitted movement allowed essential movements to reduce business disruption and loss of revenue. In addition there was reduced egg disposal which lessened the burden on affected producers as well as waste management facility capabilities, and fewer egg shortages, thus benefitting processors and allowing them to better meet consumer demand.” The 2016 article, by J.M. Thompson and D.L. Pendell, is titled "Proactive Risk Assessments to Improve Business Continuity." In the event of an outbreak, federal and state regulatory officials will work together to manage the response, with a goal of detecting, controlling and containing FMD as quickly as possible, with the ultimate goal of eradication. According to the ISU team, authorities will quickly establish a control area around infected premises. The minimum radius of the control area will be 10 kilometers, or 6.2 miles, but it could be much larger depending on specific circumstances. Producers likely will need permits to move livestock within, into, out of, and through control areas. Controlled, risk-based movement of animals, supported by robust biosecurity measures and ongoing surveillance, will be critical for maintaining business continuity and the agricultural economy while suppressing and eradicating an outbreak. The SMS and SBS plans reflect this approach by providing detailed recommended steps, procedures and responsibilities for regulatory officials, producers, packers and processers related to managed movement of animals and animal products in an FMD response. · Brief descriptions of and links to FMD Response Guidance Documents. · Considerations and responsibilities of stakeholder groups related to managed movement of animals in an FMD response. · Guidelines for participation in the SMS and SBS Plans, including what to prepare prior to an outbreak, and what should be done once FMD is diagnosed in the U.S.
· Guidance for requesting a Secure Food Supply Movement Permit during an outbreak. · Links to additional resources and contact information for the opportunity to contribute comments or suggested edits for improvement. The ISU team emphasizes that veterinarians will play a critical role in facilitating preparedness of individual producers. As a first step, a veterinarian can encourage clients to request a National Premises Identification Number (PremID or PIN) from the office of their state’s animal health agency to facilitate movement requests during an outbreak. A PIN requires a valid 911 address and a set of matching coordinates reflecting the actual location of the animals on the premises. A PIN will be required to request a movement permit. Having a PIN before the outbreak will speed up the ability to move feed manure and animals. To obtain a permit to move cattle during an outbreak, producers will need to provide regulatory officials with evidence they will not contribute to the spread of disease nor put their own animals at risk of exposure. This will require a biosecurity plan, including enhanced measures to account for known exposure routes for FMD. 1. A Biosecurity Manager responsible for developing an enhanced biosecurity plan and ensuring training and compliance on biosecurity protocols. 2. A written operation-specific biosecurity plan. 3. A Line of Separation- an outer control boundary around, or within, the premises to limit movement of virus into areas where susceptible animals can be exposed. The CFSPH team also encourages producers to develop contingency plans to maintain animal welfare during periods of no animal movement. This planning should, for example, include processes for delivering feed to animals in a Control Area while maintaining biosecurity using a defined line of separation (LOS). 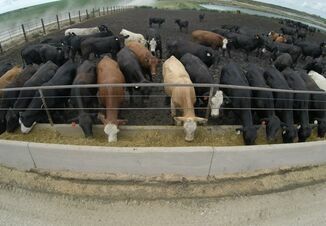 An operation could identify a location where an auger truck could remain outside the LOS, with the clean auger delivering feed over the fenceline, while the crew inside the LOS collects the feed for delivery to animals. Inputs and outputs to consider in this planning include incoming and outgoing cattle, feed inputs and delivery, harvest, bedding, fuel, propane, veterinary care, deliveries, and garbage, manure, and mortality removal. Ongoing surveillance during an outbreak will help the industry manage animal movement while minimizing the risk of exposing non-infected cattle to FMD. Roth and his team note that current sampling and diagnostic tools have significant limitations. These surveillance methods cannot prove freedom from infection, they can only establish lack of evidence of infection. Serum antibodies are not detectable until several days after infection and typically after cattle develop clinical signs. Virological surveillance diagnostic tests are available, but involve challenges with practical sample collection for herd-level surveillance, laboratory capacity, test validation, and proficiency testing. Authors of the SBS and SMS Plans say accredited veterinarians could be designated by regulatory officials to periodically inspect cattle for evidence of FMD infection. This process could be supplemented by daily observations by trained on-farm Cattle Health Monitors using a process termed Active Observational Surveillance. Herd veterinarians can assist with education of Cattle Health Monitors, and can access educational tools on the SMS and SBS websites, including handouts, narrated Power Point lessons, posters, pocket guide, wall charts and forms to assist with daily observations. Cattle Health Monitors would need training for early recognition of abnormal production parameters and clinical signs of FMD infection, which may look like other diseases in its early stages. Signs of FMD can include: drooling, fever, (103 – 106°F; 39.4 – 41.1°C), reluctance or inability to eat, lameness, reluctance to move, redness or blanching of coronary bands, nasal discharge, depression, and sudden death in young calves due to myocarditis. Current thinking on FMD response in the United States places much more emphasis on vaccination, rather than reliance on culling, or “stamping out” as a primary control measure. Some culling of infected or exposed cattle will remain necessary, with numbers depending on the scope of the outbreak. Experience in recent outbreaks in other countries shows that a well-managed, strategic vaccination program can reduce economic losses while helping a country eradicate the disease, achieve FMD-free status and resume normal trade in beef and dairy products. A successful vaccination program will depend though, on the industry’s ability to produce, distribute and administer large quantities of vaccine, containing the appropriate antigens for the circulating viral strain, in a short amount of time. Scientists involved in FMD response planning agree that we currently lack that capability. The USDA currently operates a small North American foot and mouth disease vaccine bank for use by the U.S., Canada, and Mexico at the USDA and DHS facility at the Plum Island Animal Disease Center, NY. The World Reference Laboratory for FMD recommends that vaccine banks maintain 23 different vaccines to cover the more than 60 known strains of the FMD virus. The North American FMD Bank has only about 14 strains with only a few million doses of each strain. “Surge capacity” remains limited, as finished vaccines must be manufactured overseas and there is very limited worldwide capacity to produce the hundreds of thousands of doses that the U.S. would need quickly in a large outbreak. With today’s system, Roth says, it likely would take weeks for the USDA to provide adequate vaccine doses to deal with a small FMD outbreak, and months for a large outbreak. The USDA has recognized this deficiency, but does not have the funds to acquire an adequate FMD vaccine stockpile. The National Pork Producers Council (NPPC) recently released an issue paper calling for Congress to provide the funds so that USDA can upgrade the vaccine bank and build a system for rapid deployment of the right vaccines to the right animals at the right time, in response to an outbreak. NPPC cites research from Iowa State estimating the economic impact of a significant outbreak of FMD to the U.S. beef and pork sectors at $128 billion over 10 years, or an average of $12.8 billion per year. Corn and soybean farmers would lose around $44 billion and $25 billion respectively over 10 years. Combined losses to the beef, pork, corn and soybean sectors would reach nearly $200 billion over 10 years. Direct job losses attributed to FMD could exceed 58,000 per year, with total annual job losses near 154,000. Considering the risk and potential economic impact of an outbreak, the required investment in vaccine capacity looks relatively small. In January 2014, the CFSPH at Iowa State University issued a draft white paper titled “FMD Vaccine Surge Capacity for Emergency Use in the United States,” with Dr. Roth the lead author. They estimated the cost of funding adequate surge capacity at $150 million per year for five years — an investment that could save the industry billions in the event of an outbreak.